Bijou (French for gem) is an appropriate name for this speaker. It's a small shelf speaker with Visaton AL 130 and the ceramic dome KE 25 SC. ... "The slight rise in the frequency response we noticed in the lab results are definitely not audible as a sharp and bright sound - the reproduction is rather extremely clean and full of details without any strain and compression. This impression of airiness is also the result of an immense three-dimensionality, especially live recording are astonishingly realistic. No merging of fine details, every musician is clearly locatable - the recording location is clearly defined. This gripping live impression is impressively supported by the respectable dynamic abilities of this small speaker - the Bijou is quite capable of producing real bass, even at higher volumes. Alright, rock concert close to the original volume are out of the question, but everything below is done with ease. 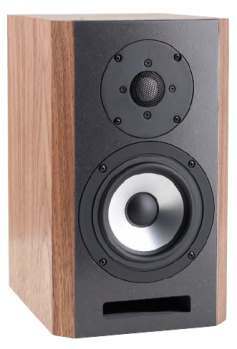 If we look at speakers of a similar size that were published in Klang+Ton lately, only the three Mini Monitors in issue 06/2007 performed at a similar level. In her element - the reproduction of natural instruments faithfully captured in live atmosphere - there is hardly another speaker that can outstrip the Bijou." The original Visaton kit with excellent building instruction and finished crossover is also available.